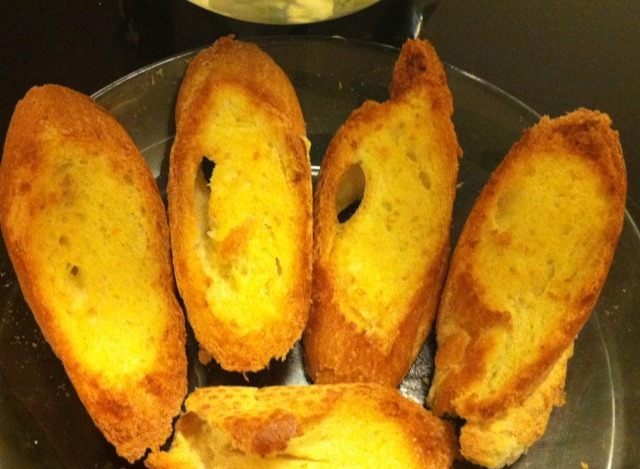 These lovely crispy garlic bread slices go really well with soup or risotto. They’re easy to prepare and super tasty. Pound the garlic and salt in the mortar and pestle. The salt will help the garlic break down and form a smooth paste. Mix this well with the butter. This can be stored in the fridge and used to grill steaks or cook mushrooms. For garlic bread, slice the bread on the diagonal, spread the butter mix and bake for about 5 minutes in a preheated oven at 180 degrees. Enjoy!